Located along the road from Puerto Jimenez to Carate is the sprawling Finca Bijagual (pronounced Bee-Ha-Gwahl). Both a tourist destination, offering guest cabins, a restaurant, and horseback riding, Bijagual is also a functioning cattle farm. Bijagual is owned by the always pleasant Don Trino. A towering and elderly Tico, he is bespectacled and always clad in a Hawaiian style button down. Instead of floral patterns, his shirts feature images of cowboys roping steers, fisherman battling marlin, or scenes of Daffy Duck and Goofy sipping cocktails on a beach. He can always be found hanging in the restaurant, an open-air pavilion located just adjacent to the road. The Bijagual restaurant also serves as a venue for the occasional dance party, events that draw attendees from all the nearby villages. Beer and cacique guarro (Costa Rican-made sugar cane liquor) flow freely while partiers couple up to dance the merengue, salsa, and bachata. These events go late into the night, and almost always go on without incident. The same, however, cannot be said for one Bijagual party that occurs but once a year. Coinciding with the birthday of Don Trino’s son, this event is the annual castrating of the bulls. While living in Carate last year, I actually missed my ride to the event because I was too hung over from the previous night’s festivities. You see, the ‘castration party,’ as gringos like to refer to it, begins at 7:00 in the morning. And after that day’s festivities were coming to a close and friends began to return to Carate from Bijagual, they imparted upon me tales I thought unbelievable; tales of men roping and wrestling rampaging bulls, the savaging of one such hombre by a wild-eyed bull, and the graphic descriptions of the castration process that the animals endured. I was tormented with regret for having slept through such an apparently chaotic, brutal, and bizarre event, such as was described to me. So, as this year’s ‘castration party’ drew near, I made my plans as shrewdly as I could to ensure my ability to attend. I made sure I was off work, had arranged transportation, and that my camera batteries were charged and ready. Arriving at 8:30 in the morning, I knew I was late to the party. After being dropped off at the restaurant, I quickly made my way back to the corral where the melee was already underway. Walking along the aging wooden fencing, I observed two dozen young bulls crowded into the corner of a large holding pen. They eyed me with suspicion, apparently anticipating the battle that awaited each of them. In the adjacent pen, a group of about twenty men and a couple of women knocked back beers and shots of guarro. They were already covered in dust and sweat, laughing and twirling lassos. A six foot tall fence encircled the arena, which was about 60 feet by 40 feet in size. Perched atop the fence were at least two dozen spectators. A table was setup just outside the pen serving cold beer, guarro shots, and chunks of barbecued beef. Spectators line the fence during one of the drinking breaks between castrations. Before reaching the gate though, I was intercepted by a smiling and hand-shaking Don Trino. He greeted me warmly, then opened a small side gate and ushered me into the corral. I scanned the pen, looking for my next move. Locating the smiling and intoxicated face of my Aussie friend/drinking buddy Rock sitting atop the fence, I made my way over to him and attempted to clamber up the wooden planks. However, my nerves were a bit raw, and I succeeding in knocking over three freshly opened beers in the attempt. Expecting disapproval from the beers’ owners, I was surprised when a Tico, who witnessed my clumsiness, approached me smiling and handed me a cold beer. I had arrived during one of the drinking breaks taken between the castrations. 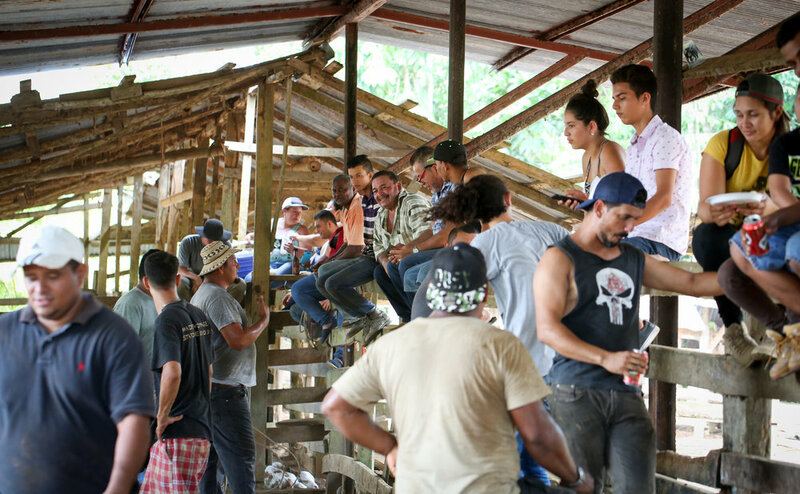 But soon, three Ticos, one barefoot, entered the holding pen where the remaining bulls were being held. They waved sticks, shouted and ran at the bewildered bovines, eventually separating two from the herd. These two bulls were urged towards a gate where a man was waiting to open it just long enough to let the two rush into the main pen before closing it off again. Waiting on the opposite side of this gate, inside the main pen, three Ticos were waiting, twirling lassos over their heads. As the bulls sprinted in, they let the lassos fly, one out of the three finding its target around the blunted horns of one animal. The terrified bulls ran a gauntlet of flying lassos around the perimeter of the pen. Each time a bull passed, all the spectators on the fence had to raise their legs to keep out of range of the stampeding animal. Several lassos had landed true by this point, one around a bull's neck, another around its back legs. The ends of these ropes were fastened around wooden posts supporting the pavilion, preventing the bull from escaping. More lassos flew, and as the animal was immobilized, a tall man with a pock-scarred face grabbed the bull in a headlock. The man twisted its head as two other men pushed hard on its hind quarters. The spectators cheered as they wrestled the bull to the ground. Once it was down, two more Ticos jumped onto the animal to prevent it from rising. At this moment, the animal actually appeared to calm down. A Tico finds himself on the receiving end of a charging bull. A middle-aged man casually approached the animal, unfolding a pocket knife with a four-inch blade. He calmly leaned over the bound bull and within seconds, he had opened the scrotal sack. He pulled the bull’s testicles from their sheath and deftly cut them from the tissue and tubing connecting them to the animal. The severed testicles were then tossed into a water filled bucket, red from blood and bobbing with the day's deposits. The knife-man then grabbed a handful of salt from another bucket and inserted his hand into the open scrotal sack, depositing the salt there as an antiseptic. Throughout this entire process, the bull did not flinch or kick even once. The buckets and knife-man then moved to the second bull, now restrained and lying still under its own pile of Ticos on the other side of the pen. The ropes were removed from the first animal, and the small, barefooted man took a seat upon the back of the newly castrated steer. Once settled, he gave a small nod to the the other men who jumped off of the the animal's back in unison. As they did, the steer rose with the bare-footed Tico mounted atop its back. Feeling the weight, it went into full rodeo mode, taking off and giving one strong kick, sending its rider falling hard onto the rocky ground. The spectators cheered, laughing as the man scrambled to his feet, just avoiding the down-tilted, charging head of an angry steer coming at him for revenge. As he scrambled up a fence, a side gate was opened, and the steer raced through it into an open pasture. A group of Ticos battle to bring a bull under control. By this time, the other animal was neutered, and a young woman was climbing atop its back. She lasted only as long as the first rider had before being deposited into the dirt face-first. Her fall looked painful, but she rose smiling, painted in a muddy mix of wet ground and manure. With both bulls castrated and out of the pen, fresh beers and shots of cacique went around to all, and the muddy-faced Tica posed for portraits, letting the dirt tell the tale of her bravery against an enraged steer. A young Tica readies herself for a bull ride. This process, although rowdy and brimming on the edge of catastrophe, had a certain order to it. After each pair of bulls were let into the main pen, and the whole dusty, bloody ritual carried out, two more riders would be dumped to the ground, nearly trampled, and then more drinking. After witnessing that first pair of bulls come through, I was ready to descend the fence to the ground amongst the action and in harm’s way for a chance at capturing the essence of the event in a photo. There were quite a few other people standing at ground level, though not participating in the roping and wrangling. I saw them scamper up the fence every time harm came bucking in their direction. I figured myself spry enough to keep up with the rhythm and dance the same dance they were. I, of course, failed to consider the fact that with my eye pressed to the viewfinder of my camera, I would be completely blind in my periphery. Luckily, I had some guardian Ticos on my side. At one point, while working hard to get a shot of some of the men wrestling a bull to the ground, the other animal in the pen broke free from its restraints and plotted a course straight for my destruction. With my attention fully on my viewfinder, I heard what seemed like everyone suddenly shouting in my direction. I lowered my camera, instantly sensing a a barreling juggernaut approaching on my right. My brain froze. But fortunately, my feet thought for me and took one step back. The bull was a pounding blur of brown fur. With its head bowed in anticipation of contact, it attempted to drive straight through the very spot I had just been standing. But thanks to my slight change in position, it only grazed my right arm, spinning me to my left. Its thick skull clipped the hood to my lens, which was sent flying into the corner of the pen. Still on my feet, I felt my muscles unclinch, and my eyes open. Assuredly, with a look of total dismay on my face, I looked over my shoulder to see everyone laughing and cheering for my near miss. But, this bull was not finished. It wanted another whack at crushing me. It had rounded to its right after grazing me the first time. Now, it turned and came at me a second time. This time, my brain was working, and I ran backwards away from the charging bull and scrambled up the nearest fence. Unfortunately for me, the nearest fence was the gate through which the bulls were being let Into the pen. It was flimsy and made of fewer horizontal planks for me to use as steps. I clambered up as best I could, finding purchase enough to land my crotch on the top bar of the gate. But, my right leg still dangled dangerously into the pen. The bull reached the barricade with force, momentarily pinning my leg between his forehead and the fence. Barely keeping my balance atop the rickety gate, I was saved when one of the wranglers grabbed the bull by its tale, pulling him backwards and redirecting its anger towards a new foe. And then, more beer. More cacique. An enraged bull fights against two lassos around its neck. After having come so close to what would surely have been my absolute destruction, I shot the rest of my photographs with my other eye open, and kept closer to the safety of a solid fence to climb should another bull single me out for a goring. By 11:30 that morning, all the bulls had been castrated and let out to the pasture to recover. And by this point, everyone there was feeling good and lubricated. We made our way out of the pen. Everyone was chugging beers and ripping into huge pieces of barbecued beef. The party was now to move to the restaurant, where there would be music, dancing, and more drinking. I assumed that the real spectacle had now passed, that the violence of the day had ended, and that the biggest challenge lying in front of all of us was figuring out how to keep drinking for the rest of the day and night without losing consciousness there at Bijagual. I was, however, quite wrong about this. Check out part 2 coming soon. And until then, here are some more photos from the day. Paison, the barefooted Tico, gets dumped to the ground by a bucking bull. Gary and a few other Ticos work a bull to the ground. A local man known as Gato clambers up a fence to avoid a charging bull. 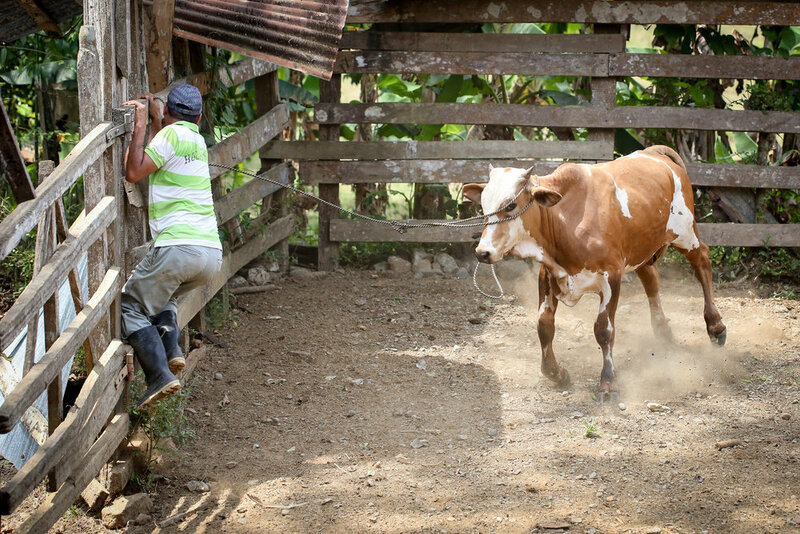 A young Costa Rican man attempts to bring a large bull to the ground. The pock-faced man attempts to wrestle a bull to the ground on his own. With Paison positioned atop a bull, the pock-faced man scrambles to avoid being trampled. A young Tico twists the head of a bull to compel it to the ground. 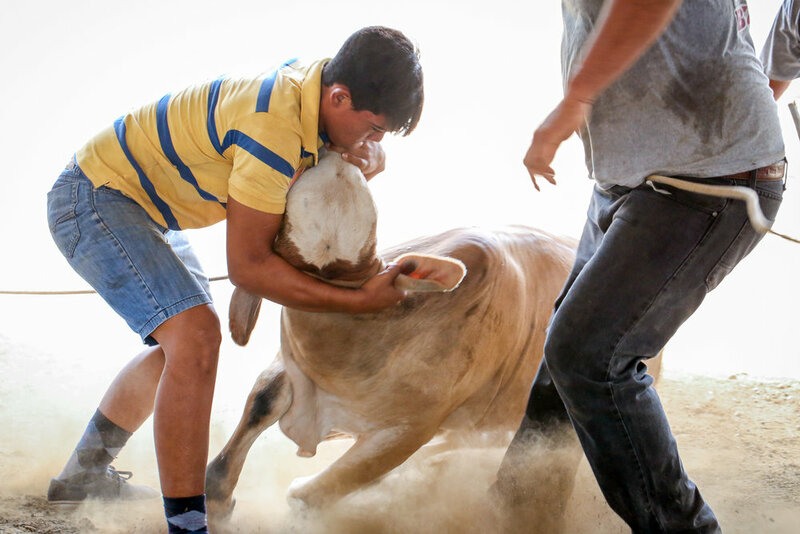 A young man braces for impact as a bull thrashes and bucks around whilst tethered to a pole. The knife-man uses a pocket knife to cut through tissue and tubing, severing a bull's testicles from its body. A Tico proudly displays the severed bulls' testicles. The young Tica, after being dumped to the ground from atop a raging bull, admires a photo of her newly earned warpaint. As of March 5th, 2018, I am living on the Osa Peninsula in Costa Rica. This blog is meant to serve as an avenue for sharing the experiences I have here and the photographs I take along the way. Fill out the form below to subscribe to Living On The Osa-Blog. Thank you for subscribing! As new blogs are posted, you will receive email notifications so you can stay up to date.